With offices in Rusk and Jacksonville, the firm's significant contributions to Texas legal history include representing many prominent individuals and national corporations, and producing judges, politicians, and local, county, and state leaders. Today, the Norman Law Firm continues in the traditions of its founders, offering exceptional legal services to families, businesses, city officials, injury victims and criminal defendants located throughout East Texas. We represent both plaintiffs and defendants in civil and criminal practice in state and federal courts, appellate matters, business law, family law, employment law, insurance law, health care law, personal injury law, real estate law, municipal law, and mediation. For more information on the firm's areas of expertise, please visit our extensive practice areas overview page. 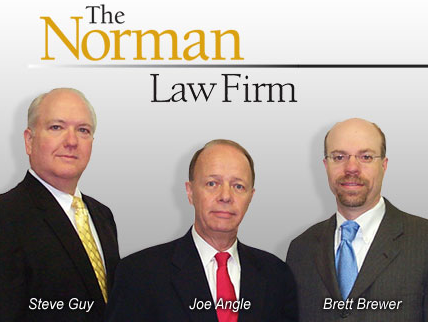 The Norman Law Firm has an established reputation in the Texas legal community as one of the premier law firms in the state. Our firm includes the only attorney in Cherokee County who is Board Certified in both Personal Injury and Civil Trial Law by the Texas Board of Legal Specialization. The firm has attained the highest possible rating of "AV" from Martindale Hubbell, the national directory of attorneys, indicating preeminent legal ability and the highest ethical standards. We are committed to providing the highest quality representation, while always striving to perform our services in a cost-effective manner. For the convenience of our clients, we offer fixed fees, fixed hourly rates, and free initial consultations. For experienced attorneys who will listen, care, and fight for you, contact the Norman Law Firm today. The Norman Law Firm represents clients in Jacksonville, Rusk, Nacogdoches, Angelina, Houston, Tyler, Bullard, Palestine, Athens, Frankston, in Anderson, Henderson, and Cherokee Counties, and throughout East Texas. The attorneys at the Norman Law Firm assist individuals, families, and businesses in Cherokee County and throughout East Texas with a range of legal matters including Personal Injury. When one person is injured due to the negligence or intentional act of another party, or from a product that was defectively designed or manufactured, the injured party may be entitled to compensation for medical expenses, lost wages, pain and suffering, and other damages. Whether the injuries occurred in an automobile accident or while on someone else's property, the law imposes liability on one who breaches a duty of care to another, subject to certain defenses. Texas is a comparative negligence state, meaning that recovery is limited in cases where the plaintiff's own negligence contributed to his or her injuries. At trial, the law assigns a "percentage of responsibility" to the plaintiff's own negligent acts. If this percentage is determined to exceed fifty percent, the plaintiff is not eligible to recover at all. However, if the plaintiff's negligence contributed to the accident in an amount of fifty percent or less, then the plaintiff still may recover against a negligent defendant, with any damage award reduced accordingly. An East Texas native, Steven R. Guy has been practicing law in his home state for nearly thirty years. Mr. Guy has the distinction of being the only lawyer in the county who is Board Certified in both Personal Injury and Civil Trial Law by the Texas Board of Legal Specialization, and Certified as a Civil Trial Advocate by the National Board of Trial Advocacy. He has also attained an AV peer-review rating from Martindale Hubbell, indicating preeminent legal ability and the highest ethical and professional standards. Mr. Guy practices in the areas of litigation, construction, contracts, family law, health care, insurance, labor and employment, municipal law, natural resources, oil and gas, personal injury, and professional negligence. A veteran of the U.S. Air Force, Marvin J. Angle earned his Bachelor's degree at Stephen F. Austin State University and his Law degree at Baylor University. Mr. Angle practices in the areas of banking, business, commercial, construction, contracts, corporate, elder law, municipal law, natural resources, oil and gas, probate, real estate, timber, trusts and estates, and wills. D. Brett Brewer received his Bachelor of Arts degree from Baylor University and his Juris Doctor degree from the University of Oklahoma, where he served as Notes Editor on the Oklahoma Law Review. Mr. Brewer was Judicial Clerk to the Hon. Ed Parks, Oklahoma Court of Criminal Appeals from 1991 to 1992. He practices in the areas of real estate, banking law, criminal law, general practice, and elder law.